Visa : Most nationalities can just buy a visa at the border for US$ 50. 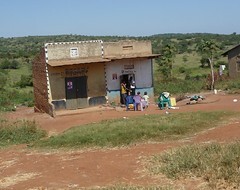 Food and water : In almost every villages theres a small shop where you can buy simple supplies (rice, flour, sometimes bread) and water/ coke. Prices : For accommodation prices and info see the list at the bottom of the page. Water 1.5L 1000ush (1200 if cold), coke 800ush, beer 2200ush, small bunch of banana’s 500ush, chapatti 200ush each. These prices are in the villages, add 50-300% to the price in tourist areas or the cities. Beer : Uganda has a good selection of drinkable beer : Bell (4%), Club(5%), Nile (6.2%) and sometimes Guinness export(7.5%) plus several cheap beers you’d rather not drink. Bell is a nice light drink, Club is a refreshing pilsner and Nile is a more fuller flavour beer and guinness is of course a little bit of civilisation in this crazy world. You wont always be able to get your beer cold due to the unreliability of the electric, and the irony of the “better bars” is that they ask if you want you beer cold or warm……. Roads : we’ll get to that later.. Dangers and annoyances : The biggest danger whilst cycling in Uganda is nutters driving trucks/cars/buses, a mirror and helmet are a must. The biggest annoyance I found was the kids. At firsts its good fun getting shouted at by every kid you pass (Mzungu, Mzungu Mzungu) but after a while it gets tedious, and in some areas(especially the Kabale-Kisoro road) they hassle you for money/pen/water too. One child after following me for 2km uphill stole some stuff out of my pannier side pocket too. I fear that in a couple of years it really wont be much fun cycling in these areas. I only cycled in a very small part of Uganda in the south west becasue I wanted to cycle in the mountains, this took me about 3 weeks. The route was Entebbe-Masaka-Fort Portal-QE park-Ishaka-Bwindi park-Lake Bunyonyi-Kisoro-Kabale-Entebbe. From Entebbe I chose to avoid a detour into Kampala (I try to avoid big cities), I achieved this by chartering a small wooden boat near the ferry terminal in Entebbe to Lulongo, this cost me 10,000ush (after a little bartering). 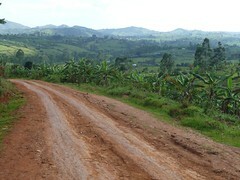 From Lulongo its almost 20km dirt road up to the main Kampala-Masaka road at Mpig. Then the hell starts! The road to hell : Two years previous to this trip I cycled in Thailand where motorists often almost caused accidents by giving me alot of space, Uganda is a whole diffrent ball game. As a cyclist your pretty much at the bottom of the traffic food chain. Nobody will give you room, they will often sound their horn, that doesn’t mean hello it means move! 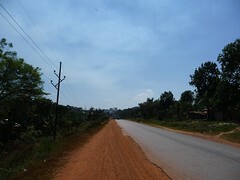 Parts of the Masaka road had a shoulder but most it was just a dirt path next to the road, where I spent most of the time cycling. 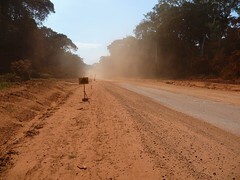 Large area’s of the road are very dusty and under construction. All in this was a stressfull 1.5 days cycling to Masaka, if you plan to cycle this road then you really need a mirror, it may just save your life! I camped wild in the dunes 5km before Lukaya and once in Masaka stayed at the Zebra Hotel. 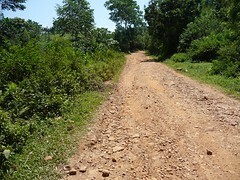 Once outside of Masaka the road north quickly becomes a dusty dirt road. This has the advantage of less traffic, but the traffic that does pass creates a huge dust cloud (bring a dust mask or bandana). 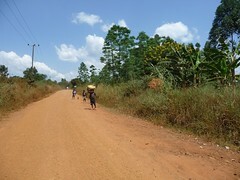 There are plenty of villages on this road so food and water are not an issue. Some parts of the road are pretty rough and can be quite steep too. The first night I camped wild in a grazing area, the second in a field just west of Lusalira on the Fort Portal road. The first night I stayed at the very nice though simple campsite at the first crater lake (Lake Nburuba community campsite). The road to the campsite (18km) was pretty rough but ok. I had a nice quiet afternoon at the site, which has a forrest walk where you see lots of Black and white Colobus monkeys. In the morning I was entertained by a dozen other monkeys playing near my tent (they haven’t been spoiled by tourists yet). According to my map it wasn’t possible to get from the crater lakes back onto the Kasese road without going back to Fort Portal, luckily this isn’t true and the track continues for 18km past various lakes until it hits the main road just north of Rwimi. After that its another good tarmac road all the way to Ishaka. If your thinking of staying a night in Hima, think again its the site of a concrete production factory so the whole town is covered in a nasty dust. Just after the bridge over the river between Lake George/Edward and about 3km from the QE park entrance you see the sign for the QE park Bushcamp. This is well worth a visit and camping with your own tent is only $5 (was for me anyway…)using the Bushcamp rooms/tents costs $60-90. IF YOU GO TO THE BUSHCAMP WATCH OUT FOR THE SMALL THORNS, I GOT 7 PUNTURES IN 1 EVENING. 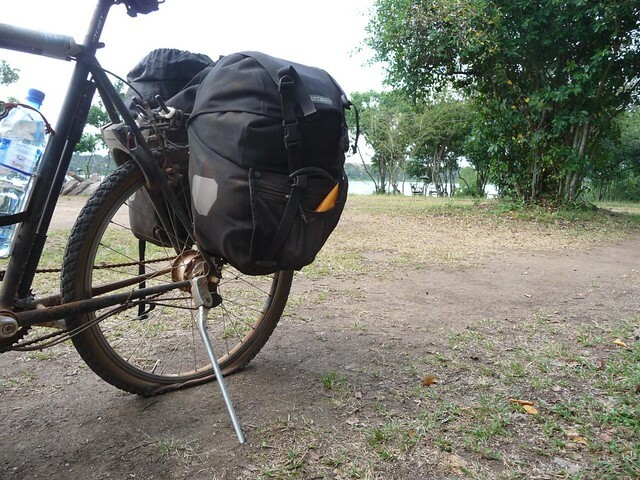 Cycling in Queen Elizabeth National park: Due to my incident with so many punctures the previous evening I chose not to cycle the dirt road through the park itself, but instead took the tarmac road to Ishaka. Here’s some facts about cycling in the park to help you make your mind up if you want to do it. 2. I spoke to a German guy the day before who had cycled through the park, “I wouldn’t do it again, too many elephants”. 3. I spoke to some park rangers who said only 2 People had been killed in the last 5 years on the road, 1 local whilst cycling, 1 tourist in a 4×4 who was trying to piss an elephant off to get good photos. 4. You will see elephants and maybe lions on this road. On the tarmac road to Ishaka my might see elephants and other stuff, I saw a warthog and some boks. 5. I was relieved I had an excuse not to go through the park, which says enough a guess, I’m not always the tough guy I wish to be I guess…. The road to Ishaka has nice views of the Savannha and a couple of cheaky little climbs. Ishaka has an internet cafe, though it is painfully slow, is also has a selection of hotels for various quality and prices, see the table below. This is about the time when more kids start asking for money/pen. 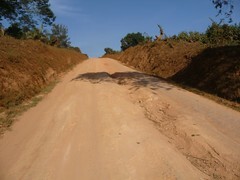 Ishaka – Rukungiri: the second worst road I’ve cycled to date. Rukungir – Karungu: the worst road I’d cycled to date (Before the Big Africa trip anyway) . A picture paints a thousand words. Down hill is almost as slow as uphill because its so bad…have fun! I wild camped in a forrest just before Rukungiri the first night, the second at the King lion gardens about 2km after Karungu, the food and service was great but I’d recommend camping instead of getting a room! The 3rd worse road I’ve ever cycled 🙂 This was pretty much 11 hours of hell for me, it took 3 hours to descend the first 25km because the road was so bad, after that it was a long long climbup to 2300m and then several more hills around 2300m, a hot thirsty day. There are not many villages with a shop along this road so be careful with you food and water (though I may have been distracted by the 30-40 kids following through most villages). This was one of the days where alot of kids asked for money/pen. 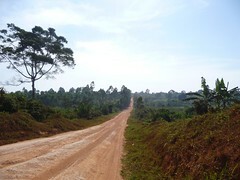 The road is largly gravel and cycling through the Bwindi National park often has gradients beteen 6-10% some parts are borderline inpossible to cycle because of grip issues. The Ruhija Gorilla resort campsite has a great location on the side of a mountain with nice views, and after a day like this one it was great to get an (almost) cold beer and food. After about 30 minutes up and down with a couple of cheaky climbs its pretty much all down hill until just before Kabale (incl 20km new tarmac with shoulder). 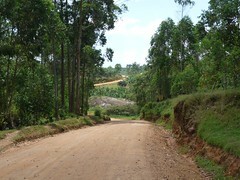 The last 7km to Bunyonyi is once again dirt road and has a short but very steep climb just before the lake. Then you get to spend a couple of days in paradise!!! I recomend the Kalabas guesthouse its smaller and quieter than the popular overland resort. A beautiful ride along the dirt road along the lake, then onto new tarmac until the top of the pass, after that it was 25km of road works and dust to Kisoro. In Kisoro you can climb one of the Volcano’s or do some gorilla tracking for $500 per day (will soon be $700), apart from that there’s nothing to do or see unless your planning on crossing into DR Congo or Rwanda, they do have a great internet cafe in town with broadband though. This road was a nightmare with kids, they all wanted money/present/pen/water/shoes/food etc etc, and some where aggressive about it. One kid followed me for a couple of kilometers and finally gave up by stealing stuff out of the side pockets of my panniers. Not a nice day. I suspect that in a few years they’ll start throwing stones here like in other parts of africa. In Kisoro I stayed at the Heritage guest house, which had an ok room and food. Though the road is under construction it has already been graded, so its generaly 6% so it only takes a couple of hours to get back to the pass. 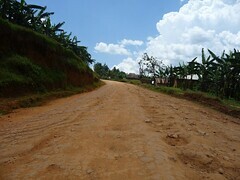 After that its a nice road all the way to Kabale (with a couple of climbs). In Kabale I splashed out and got a good hotel for a couple of days. Kabale is just another one of those dusty, noisy africa cities. 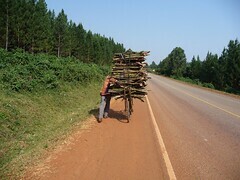 Within 2 hours of leaving Kabale I already had a sore neck with looking behind me for traffic. A couple of people I’d met a few times in the previous weeks offered to give me a lift to Masaka. The ride in the 4×4 quickly got boring and I started wondering if I was doing the right thing, but in the end it turned out that large area’s of this road are under construction and are a dangerous dusty mess. This one day journey saved me 4 days of stress. We camped at Lake Nabugabo holiday center 20km outside of Masaka, this was a beautiful stop and only 25km away from the ferry to the Ssese islands. A nice easy and flat ride to the ferry at Bukakata, the ferry runs every couple of hours but occassionall you can also get a lift with a fishing boat for 3000ush like I did. Once on the island its a fairly easy trip to the main town/ferry/campsites, with a couple of small hills. I stayed at a campsite next to the ferry terminal(to Entebbe) its a nice location but the toilet/shower block is pretty rough. 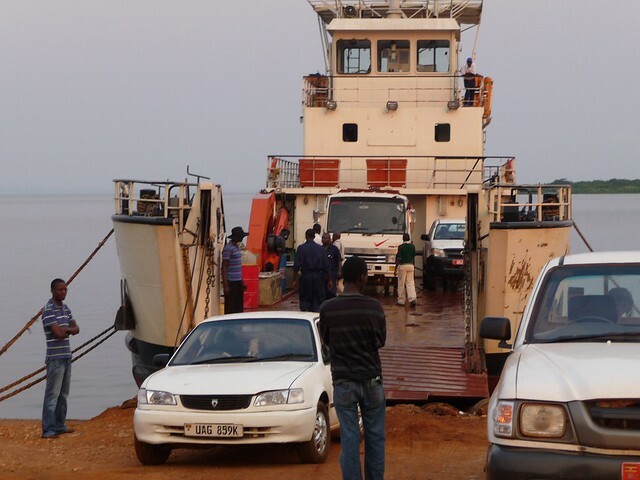 The ferry is very unreliable so check out with the locals in Entebbe/ Ssese if its running, its runs once a day in each direction leaving at 8am from Ssesse it arrives at about 11.30, in the afternoon it leaves at 1pm (I believe) back to Ssese. The cost is 10,000ush per person. Here’s a list of the places I stayed with prices and wether I’d recommend it, this is of course very subjective and therefore only a guide. I take no responsibility for your experience of these place. Tips I will give though are ask if breakfast is included as this varies, and ask for discount at the more expensive hotels, I managed to get about 10,000ush discount on 3 occasions. Bear in mind that this was a shorter trip so I had a different budget than my big Africa trip. 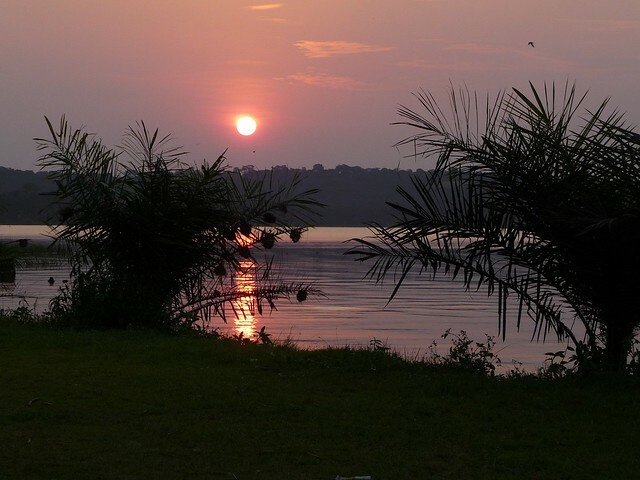 Entebbe: Entebbe Backpackers Campsite/room8000/40000 Recommend – Yes | 6km from Airport. Masaka: Zebra hotel Hotel |37,000 single| Recommend-Yes Buffet lunch dinner 10,000. Fort Portal : Rwenzori view Guest house | 72,000 per room| Recommend-YES |Great food, Quiet location. take a rest day here! Compared to other places its expensive but well worth it. Crater lake: Community campsite | Simple campsite 8000 | Recommend-Yes | Take the first campsite not the second. QE Park: QE bush camp |Luxury campsite $5/ $60-90 | Recommend-Yes |Ask first if you can use you own tent for $5 otherwise it gets expensive. The food is expensive but worth it. Ishaka (1st night): Crane resort hotel |Hotel 65,000 | Recommend-No Way too expensive for what you get. Ishake (2nd night): Cielo Country Inn | Hotel 55,000 after bartering| Recommend-Yes A nice spacious room with a clean and spacious bathroom, bar closes late though, so drink instead of sleeping:). Kanungu King Lion Gardens Guesthouse/campsite |45,000 (I think| Recommend- Dont know maybe the food and service where great but the room and bathroom where pretty grim, camping would be better. Ruhija: Ruhija Gorilla friends resort |Campsite/luxury tents$8/$20| Recommend-Yes | Nice location and views, with an option to get a hot shower. Bunyonyi : KalebasGuesthouse/camping40,000/10,000YesAwesome locations, great food (especially the expensive pizza’s) and its quiet (warm shower too). Kisoro : Heritage guesthouse | Guesthouse 55,000 |Its ok I didn’t look around much at other options in town though. Kabale : White horse Inn | Hotel 90,000 | Recommend- Maybe Its nice if your feeling rich, though too much of that “colonial”feel for me. 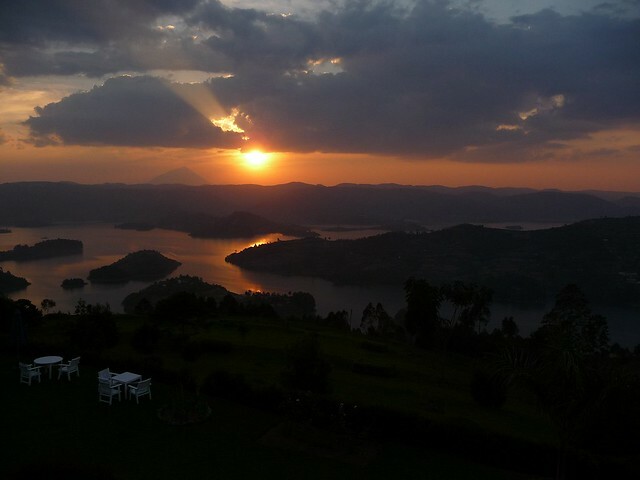 Nabugabo: Lake Nabugabo Holiday centre | Campsite 8000 I think | Recommend-Yes Nice location away from town. 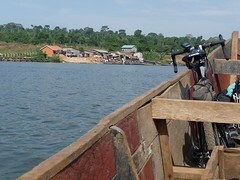 Kalangala : Campsite next to ferry | Campsite 10,000 | Recommend- nice view and close to the ferry but grim bathrooms.